The four components of Gordie Howe International Bridge, along with the Rt. Hon. Herb Gray Parkway, provide a new highway-to-highway border transportation system for the Windsor-Detroit trade corridor – the primary gateway for the delivery of just-in-time goods and parts to manufacturers and where almost 30 per cent of all goods carried by truck between Canada and the United States cross. The six-lane, 2.5 kilometres/1.5 miles Gordie Howe International Bridge is made up of three parts – the span over the Detroit River and two approach bridges. Cable-stayed and suspension are the two possible bridge types. Cable-stayed bridges are characterized by having an “A” shape and suspension bridges are recognized by their elongated “M” shape. Once complete, the Gordie Howe International Bridge will be among the top five longest bridges in North America. The Canadian POE will be situated on an approximately 53 hectare/130 acre site, making it the largest sized Canadian port on the Canada-US border. The facility will include border inspection facilities for both passenger and commercial vehicles, maintenance facilities and the tolling operation for both the US-bound and Canada-bound traffic, with tolls collected by WDBA. 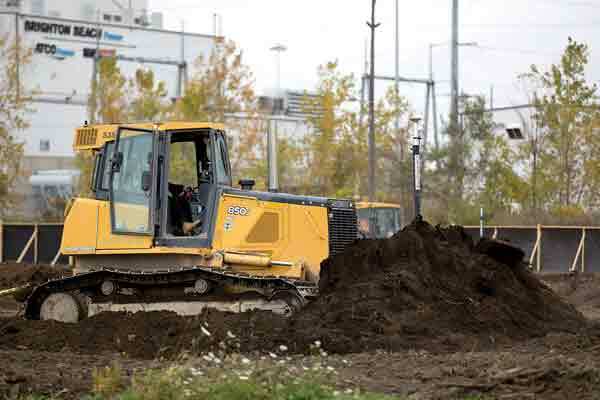 A local Windsor contractor was awarded an approximate $60 million contract for Early Works activities to complete preparatory works with additional contracts to be awarded soon. Environmental, utility, drainage and other site preparation work is on-going with many achievements already reached. The US POE will be situated on a 60 hectare/145 acres site and will also include border inspection facilities for both passenger and commercial vehicles. Progress to date at the site of the US POE includes demolition work, installation of utility duct banks, conduits and cables, environmental work and surveying. The Michigan Interchange will consist of the connecting ramps to and from the US POE and associated local road improvements required to fit the new ramps into the interstate system. The Michigan Interchange includes four new crossing road bridges, five new pedestrian bridges, four long bridges crossing the railway and connecting I-75 to the US POE, and service roads and local road improvements. As part of the development of the Request for Proposals (RFP), WDBA consulted with residents, regulatory agencies, technical subject-matter experts, Indigenous Peoples, stakeholders, commercial businesses and future users of the project components. This engagement has resulted in a robust and stringent set of requirements that will be delivered by the eventual private-sector partner, with WDBA’s oversight. The following is a highlight of a few required project features that can be shared at this stage of the public-private partnership procurement process. As part of their responses to the RFP, Proponents will detail how they intend to deliver these, and other, project requirements. The Detroit River International Crossing (DRIC) study was a comprehensive bi-national environmental study that identified requirements to mitigate potential negative impacts from a new crossing. These requirements are obligations that the private-sector partner must implement during the design construction and operation phases of the project as stipulated in the Crossing Agreement and in the contract that will be entered into between WDBA and the partner. WDBA is committed to minimizing disruptions to communities and the environment and will ensure the private-sector partner will implement steps to limit impacts to nearby residents, people travelling through the construction zone and nearby businesses. WDBA has mandated that a comprehensive Community Benefits Plan be formulated and delivered by the private-sector partner with stringent oversight by WDBA. Through consultation undertaken by WDBA and Michigan, residents, business owners and community leaders on both sides of the border have conveyed that local workforce and training strategies, construction impact and operation mitigation measures, and regional economic and community development opportunities are amongst the top priorities for communities. WDBA has listened and as part of their proposals, the Proponents will be charged with developing Community Benefits Plans that address these regional priorities. WDBA recognizes the permanent influence the Gordie Howe International Bridge will have on Windsor’s and Detroit’s skyline and its role as a new gateway symbol for Canada and the United States. WDBA is looking to its Proponents to advance unique, impressive, inspiring and iconic bridge designs. Functionality for the commercial and passenger users of the bridge and entering the POEs is also a critical aspect of project design. WDBA expects designs for all four project components that demonstrate ease of use and balance functionality with aesthetic principles. WDBA’s vision is that this is the most instrumented, technologically advanced, border crossing and we are challenging the private sector to take up this vision in their designs. Significant attention is being given to ensuring the bridge meets and exceeds the needs of commercial users and that the project includes features that will contribute to the efficient and timely movement of drivers through the facility and toward their destinations. WDBA expects to integrate design elements to make it easier for trucks to cross such as: dedicated truck lanes on bridge and in the POEs; driver-friendly road lighting; safety design accommodations such as the ability to deal with truck breakdowns in a timely fashion with minimum impact on traffic flow; and an onsite weather monitoring station allowing for advanced notification of unfavourable conditions. Tolling may include manual, automatic and electronic lanes. It is anticipated that E-manifest programs and other trusted traveller and trader programs will be in place on both the Canadian and US POEs to help make for an efficient crossing. The bridge and POEs will be equipped with “smart” technology. WDBA anticipates the use of intelligent video to monitor traffic and provide enhanced security features. A system with automated incident detection capabilities plus lane control and traveller information systems could be used to help ensure safe passage.